The last major programming construct we need to learn about at this introductory level of programming is “Repetition“. In the previous lesson I left a comment for what I referred to as “SPECIAL CODE” that was going to be dealt with in this lesson. Well the only reason I’ve labelled it “special” is because it’s not necessary for our game but it does ensure we’ve addressed all the topics you should know about to get you on the right track when it comes to programming. lblInstructions.Text = "Congratulations, you win!" 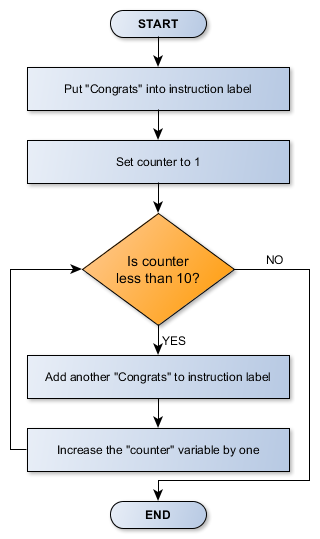 Here you can see a neat solution that would allow us to add the “Congrats” message 10,000 times if we wanted with one very minor change of our flowchart (and subsequent code). 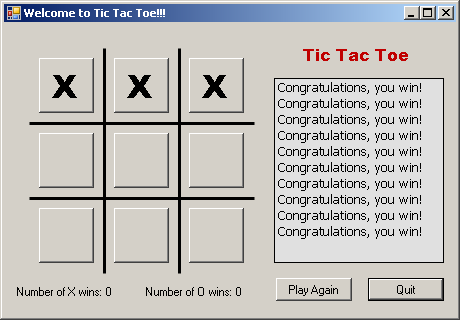 Now let’s see how this can be done in Visual Basic. Here you can see the “While” and “End While” lines wrap some code very much like an “if” statement did, the only difference is that if the Boolean Expression is evaluated to be true, then when the computer has executed the code inside the “While” loop, it jumps back to the top of the loop to test the Boolean Expression again, whenever this Boolean Expression becomes false, the loop is finished…simple! The only element now left unexplained is where the “counter” variable came from? You should get used to using variables and not fear their introduction in your code. You simply won’t be able to visualise all necessary variables before you start coding so adding them as you go is perfectly acceptable. So where will this one be defined and what sort of data type will it be? These are questions you should be able to answer now.